Can you believe April is just around the corner and Easter is almost here? 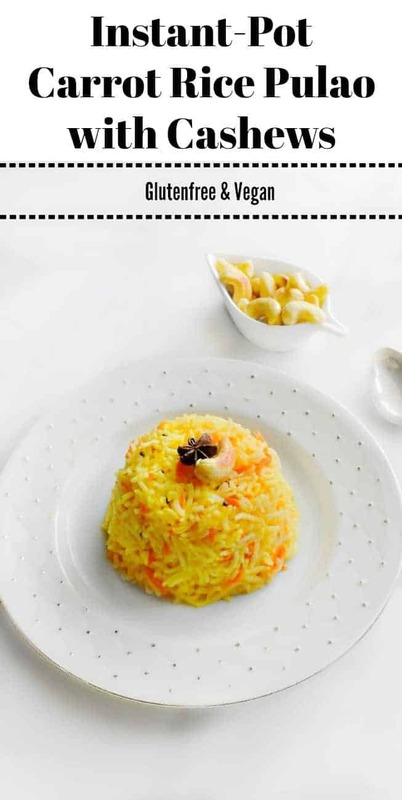 I’m making this Instant-Pot Carrot Rice Pulao with Cashews as my contribution to the Easter brunch hosted at my friend’s house. She had lots of sweets/dessert recipes and wanted some easy-peasy/quick side recipe to go with Easter brunch. 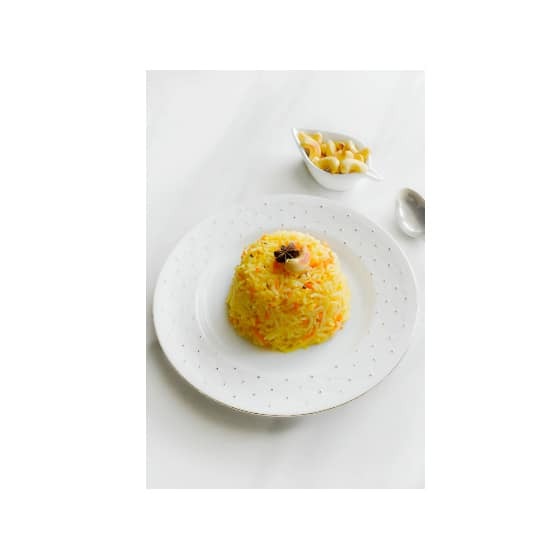 And at the same time wanted it to be filling, so I thought what can be better than this pretty pilaf. 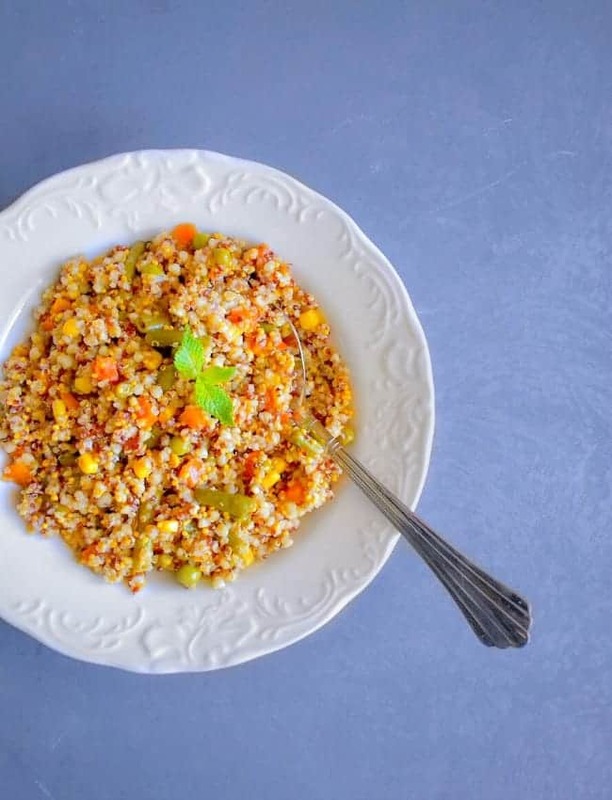 I’ve been making this Instant-Pot Carrot Rice Pulao for ages now and it’s an extremely delicious recipe that’s a light mix of rice, carrot with mild spices. 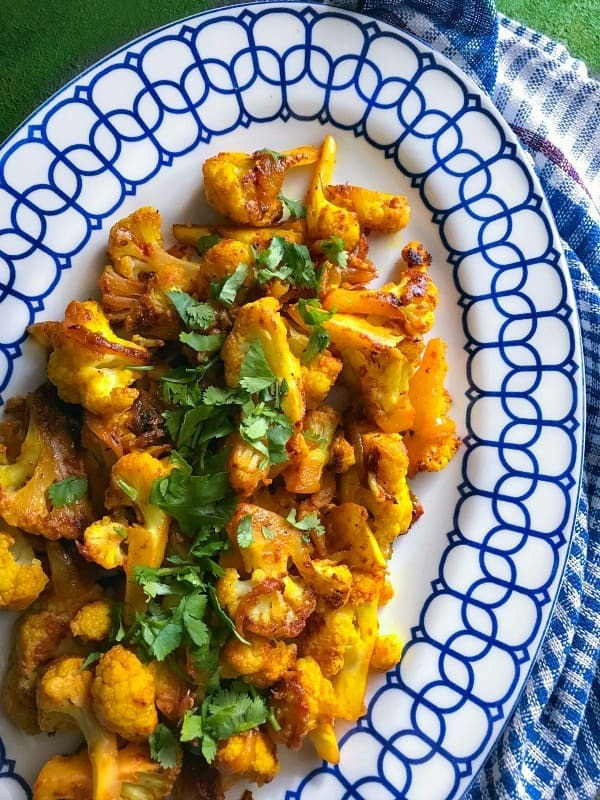 I love to top it with cashews for that extra crunch and trust me carrot-cashews are made for each other. Pressure-cooker / Stovetop-Pan / Dutch-ovens / Instant-pot. No matter what way you choose to make it, the result is delicious everytime. What I’ve also realized is that if you’re cooking it for a crowd or more than 3-4 people, its best to make it in an instant-pot or pressure cooker (electric/stovetop) as it gets done in minutes and without much steps. Just lightly saute everything in oil, add water and cook as per the gadgets used. 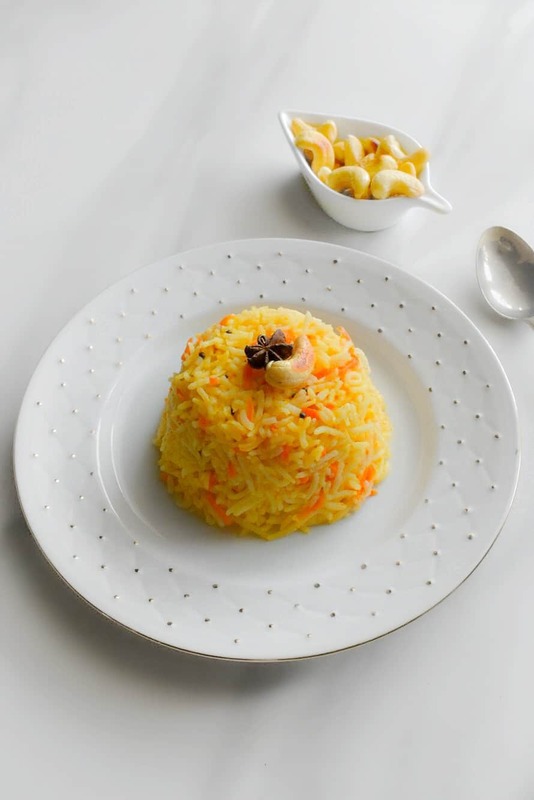 Incase of our Instant-Pot Carrot Rice Pulao version, I like to cook the pilaf in manual mode instead of the ‘Rice Mode’ as rice mode makes it slightly mushy or overcooked (using basmati rice). 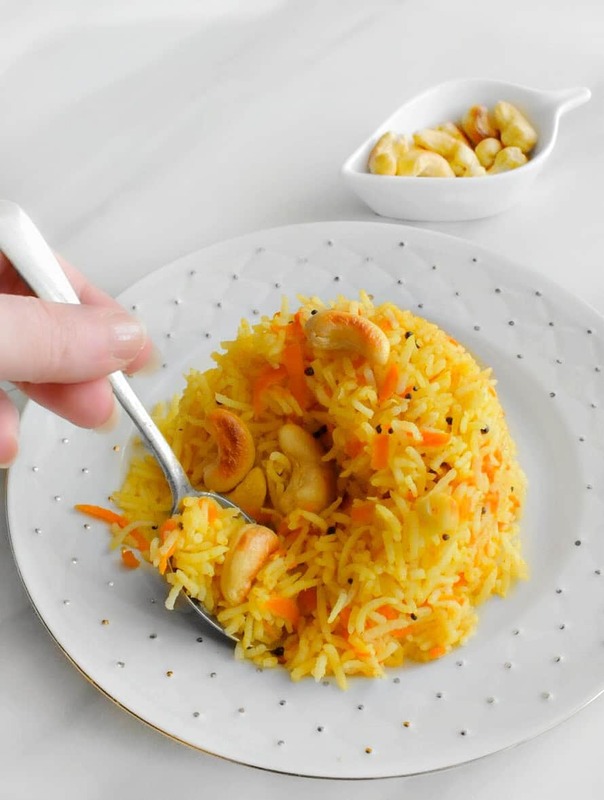 So this Easter, do give this delicious and crunchy ‘Instant-Pot Carrot Rice Pulao with Cashews’ a try or simply make it for a healthy lunch. No matter what occasion you choose, you/your guests are going to love the light and refreshing flavors of this. 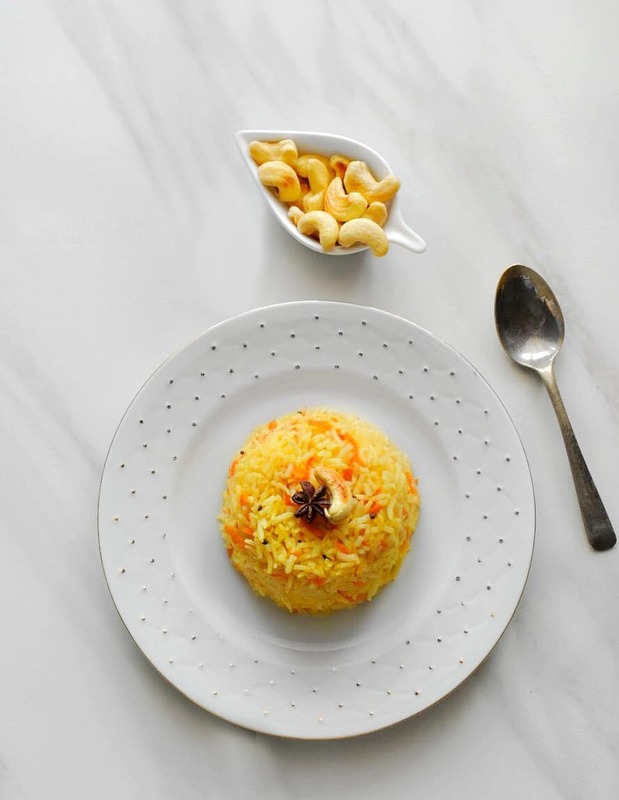 Instant-Pot Carrot Rice Pulao with Cashews (V+GF) #Easter: quick and simple carrot pilaf/pulao that makes a great light meal or a perfect side to your Easter brunches. 1/2 Cup Shredded Carrots - if using the store-bought, then chop them to small size. Start the instant pot in sauté mode and let it heat up for about a minute. Now add the coconut oil, bay leaves, cinnamon stick, 2 star anise and sauté them for 30 seconds. Remove the whole spices after 30 seconds (star anise, cinnamon stick and bay leaves). Now add the mustard seeds, onion, garlic+ginger paste and Sauté for 2 minutes until onion turn golden.? Add rest of the spices, carrots, rice and saute everything for a minute.? Finally add water and mix everything lightly to make sure nothing is stuck to the bottom or side of the pot. Close the lid with vent in sealing position.? Set the Instant-pot setting to Manual or Pressure Cook mode for 4 minutes (this will be on a high temperature). ? When the instant pot beeps for doneness, set the 10 minute NPR (Natural Pressure Release). This means let the pressure release naturally for 10 minutes and afterwards you can manually release the leftover steam/pressure.? Open the lid carefully and fluff the rice using a fork. Take 3-4 cups and lightly oil them. Now fill each cup with cooked pilaf and press them gently using hand. Place each cup in a plate (face down) and lift the cup upwards. This will create a dome shape rice on plate. Top with cashews and the earlier cooked star anise on top (optional). 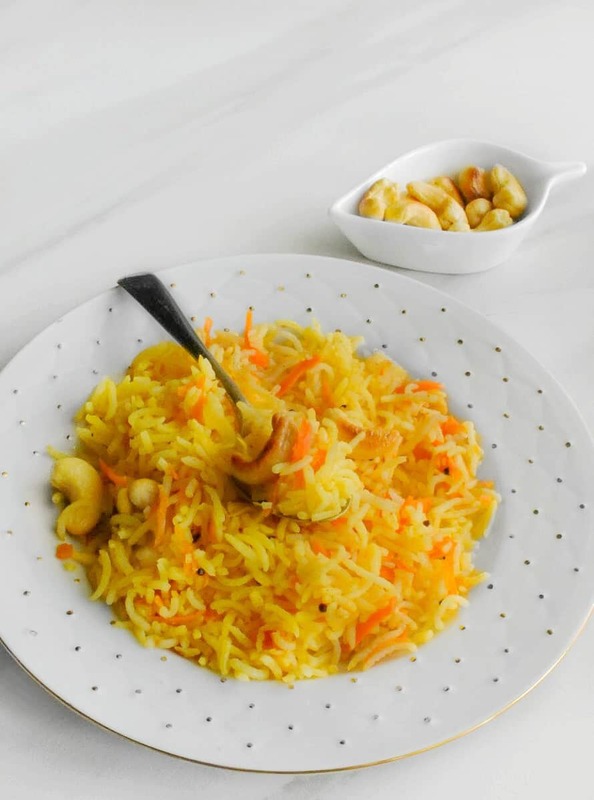 No Replies to "Instant-Pot Carrot Rice Pulao with Cashews (V+GF) #Easter"